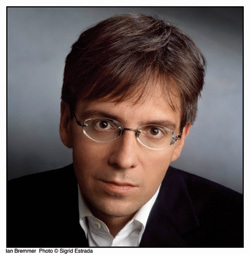 Ian Bremmer, 37, is a global-risk analyst and founder of the New York-based Eurasia Group, the world’s leading political-risk advisory and consulting firm; his work focuses on United States foreign policy. A prolific author, his latest book is the best-selling The J Curve: A New Way to Understand Why Nations Rise and Fall (Simon & Schuster), which evaluates countries through a two-part prism of stability and openness. Bremmer is an adjunct professor at Columbia. Q. What is the J curve? A. The J curve…is a graphic representation of the relationship between a country’s stability, shown on the vertical axis, and its openness, as shown on the horizontal axis. How open is that country…to things like capital flow, investment, human migration and Internet access? We find that the relationship between those two variables looks like the letter J. Countries found to the right side of the dip in the J, like the United States, Canada and Great Britain, are stable because they are open. Q. And countries to the left of the dip in the J? A. [They] are stable precisely because they are closed [and] because of their relative isolation from the international community. I am talking about, for example, North Korea, Castro’s Cuba and Afghanistan under the Taliban. If you are the leader of a country that is stable because it is closed, you are highly incentivized to keep the country closed. This is enormously important for understanding a country like Iran, where leaders recognize that the best way to consolidate their domestic power is to provoke an international conflict that allows them to more fully close off…certain types of access to the international community. Q. How would you describe Iran? A. Historically, Iran has been more open than other, more authoritarian states. [President Mahmoud] Ahmadinejad won in a largely democratic election. But now…he has [closed] down local media, is trying to limit bandwidth on the Internet, silencing many moderates. Look at his efforts to focus the entire country on Israel, the Holocaust denial question…the nuclear issue: I would argue that he recognizes that the best way for him to maintain power is by isolating the country. Q. So how does the J curve apply to Iran? A. The danger in Iran today is precisely that it is not a stable domestic political environment. The government faces real internal threats, and the best way to get rid of them is by actively pursuing a confrontational international position.… If you were to ask…the Iranian president if he thinks it is in his interest domestically for the UN Security Council to impose sanctions on his government, if he’s candid, he would say yes. If you ask him if it is in his interest for the U.S. to send additional troops to the region, I think his answer would again be yes. If you were to ask if it’s in his interest even for Israel and the U.S. to carry out surgical military strikes against Iranian nuclear facilities, I am not sure his answer would be yes. But I do think he’d have to think about it. Q. Are you saying the West should not apply sanctions? A. If you’re a country on the left side of the J curve, stable because you’re closed, effective sanctions mean two things: The country becomes more isolated and therefore more stable but also poorer and therefore less stable. So the question is, does the instability that comes with economic pain outweigh the increased stability that comes with isolation? Have sanctions against Castro’s Cuba been effective over the last 47 years? Absolutely not. Sanctions have helped Castro stay in power. Q. What is Iran’s internal dilemma? A. In Iran, there are two clocks ticking simultaneously: a nuclear clock and a reform clock. Iran is not completely stable because it is not a totalitarian regime. It has a much more complicated political structure. [There is] a president and supreme leader who so far have been rushing headlong toward confrontation with the international community, rejecting compliance in any form on the nuclear issue while aggressively provoking Israel. They are clearly developing nuclear capacities as quickly as they can. They believe they have a limited amount of time to stir the pot to quash brewing domestic reforms before they risk losing power. Do they soften their position on the nuclear program? Or do they…silence the reformers? Q. Can the United States spearhead effective sanctions to stop a nuclear Iran? A. Washington…is limited by its lack of success in Iraq and the depletion of its political capital. It’s constrained by Russia, which is unwilling to support a policy that appears to punish ordinary Iranians. The Chinese are closer to the Europeans and the U.S. than the Russians, but… Iran is important for Beijing because it feeds China’s growing energy demand. The United States might have some success in tracking and freezing Iranian assets in places like Dubai….but is that going to seriously destabilize them? I don’t expect so. So I have an issue with credibility on serious sanctions, because Iran is so important for the global economy. My hunch is that if the Iranians started feeling real pressure, Ahmadinejad’s gut reflex would be to take an even tougher line. Q. How successful is our global war against terror? A. Over the last couple of decades, the U.S. has not done well in wars against concepts, like the war on drugs. In part, that’s because you’re dealing with a supply-and-demand issue. When you’re fighting a war against a concept, the tendency is to want to show progress by bringing some people to justice…. You can launch massive sting operations on Colombian drug cartels and stop $500 million of cocaine from reaching the streets. Everybody applauds. Yet, steady demand for narcotics…ensures the so-called war has been anything but won. [Terrorism] is the same. You go after the suppliers of terror, the leaders of Al Qaeda, but the fundamental lure for new terrorist recruits comes from many things, including a feeling of powerlessness vis-à-vis entrenched, authoritarian Arab governments. This fosters strong and growing anti-American, anti-Western feeling and leads new recruits to embrace terrorism. As long as demand for terrorism within the Muslim world remains strong, you cannot completely eradicate the organization and terrorism will continue. Q. Why doesn’t the United States know how to bring about change in closed, threatened countries? A. Authoritarian leaders will do anything they can to keep power. When Secretary of State Condoleezza Rice warns North Korea to behave or risk isolation, the North Koreans demand cash, but they don’t necessarily seek direct foreign investment [because] they don’t want to be brought into the international community. An end to isolation would be the end of the North Korean regime. This is the reality that Americans fundamentally misunderstand. If one’s goal is regime change, you accomplish this by [drawing them] into the international mainstream. Q. Can you cite an example? Q. Why are two such different approaches being used? A. They’ve gotten the China policy right because it is the one part of the world where the people setting policy understand globalization and the interdependence of the U.S. and Chinese economies. For the long term, I think this is the direction to go.